(CNN) - Former President George H.W. Bush remains in a Houston hospital Thursday after being treated for bronchitis, his spokesman said. His office said he was in stable condition. 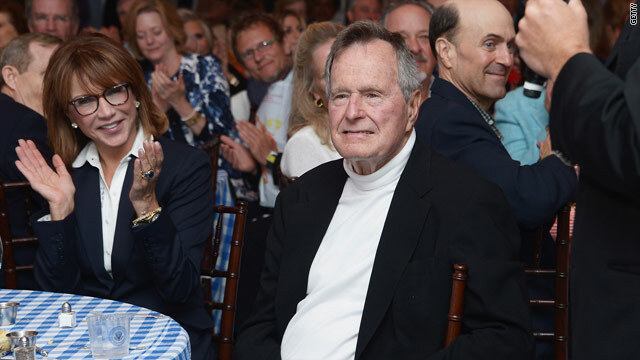 Bush, 88, has been hospitalized at Houston's Methodist Hospital for six days and has a "lingering cough," spokesman Jim McGrath told CNN. "President Bush has been in and out of The Methodist Hospital in the Texas Medical Center being treated for complications related to his bronchitis," his office said in a statement. "He is in stable condition, and is expected to be released within the next 72 hours." Bush has a form of Parkinson's disease that affects his legs and requires him to use a wheelchair. He was previously hospitalized overnight in 2007 after a fainting spell caused by dehydration and hot weather while golfing in California. - CNN's Chuck Johnston contributed to this report. Bless his heart! Prayers for your recovery. One of the very few Republicans that I admire. A true gentleman. Best wishes to a patriot and a true American hero. I always loved praying Presidents. Now we will pray for you. God Bless. An honorable man who has served his Country with honor and distinction. Hope he gets better quickly, G-d bless. Agreed. George HW Bush is one Republican that this liberal can respect. I hope he gets well and is able to enjoy some more good years. I didn't agree with his politics, but he's still a good man who served our country. Hoping for the best. Read my lips! "Get well soon!" Staying sick wouldn't be prudent; not at this juncture.